Public art installations are a direct conversation an audience that have volunteered to have the experience, and those who have had it thrust upon them. What questions is an artist looking to address with a piece which so carefully considers a specific landscape and it’s interaction with the actual landscape? We spoke with artist Jennifer Williams, whose site-responsive installation at Roger Smith addresses the relationship between the city and its inhabitants, to find out. Don’t miss her large scale “City of Tomorrow” exhibit, up in Lily’s through February. I make large-scale photographic installations that address the landscape directly outside a gallery/space and interaction with the architecture inside the space in a way that highlights where you are (physically, inside) and where you’ve been (walking, outside.) My purpose is to make you aware of your surroundings, both inside and out. What are the advantages and challenges of working with photography and collage at a large scale? Large-scale work is hard to pass by without noticing! It often transforms a space in a way that creates a conversation between the work, the space, and the people using it. Challenges include photography as a gathering process – shooting hundreds of files and working with large-scale printing. Most of my images are captured in sections and later tiled together like a puzzle to present as one form. The processes also mimics how we see when we look at these massive buildings, they’re impossible to take in at a glance. We’re only seeing a portion of the whole at any one time and I want you to see everything at once. Installing the work poses a bigger challenge as it often takes climbing on a ladder or a lift with the pieces, which can be quite large and hard to handle. You reference urban landscapes in your work, why is that perspective interesting to you? My work deals with pedestrian views of urban landscapes – a kind of “boots on the street” view. I aim to consider the city, both as its physical self and as an idea. A pedestrian point of view is that of the everyman, not taken from an insider’s access. Everything I shoot is visible from the street or in public environment (like a subway station); basically I’m interpreting the city as it exists in the present, puzzling together what’s in front of you. The city is a vast machine that can seem overwhelming to the individual. We often take the shortest routes between points a and b for efficiency and turn a blind eye to everything as we go. My works ask the viewer to take a moment when they leave the gallery to consider their surroundings and the past, present, and future they hold. How has the piece changed for you, now that it is the context of the Roger Smith? It’s wonderful to be able to exhibit the piece in the neighborhood it’s referencing, and installed at eye level (it was very high up on the wall at the Queens Museum so it couldn’t be inspected closely.) I love that my piece interacts with the architecture of the space, as well as the furniture inhabiting to create a conversation between all aspects of the room. I love that it’s introducing the neighborhood to those who are visiting for the first time or presenting it in a new way to those intimately familiar with the neighborhood. What is it about the neighborhood of Midtown East that you find particularly curious and intriguing? The sheer density and height of Midtown East, combined with its history make it particularly fascinating to me. It’s the epitome of Manhattan’s grandiosity, yet there’s moments of low-rise calm to be found, every turn of a street yields something of significance architecturally and historically. It’s like a living museum of skyscrapers that continues to grow with its own unique, timeless vibe of the streets grid and wide avenues. 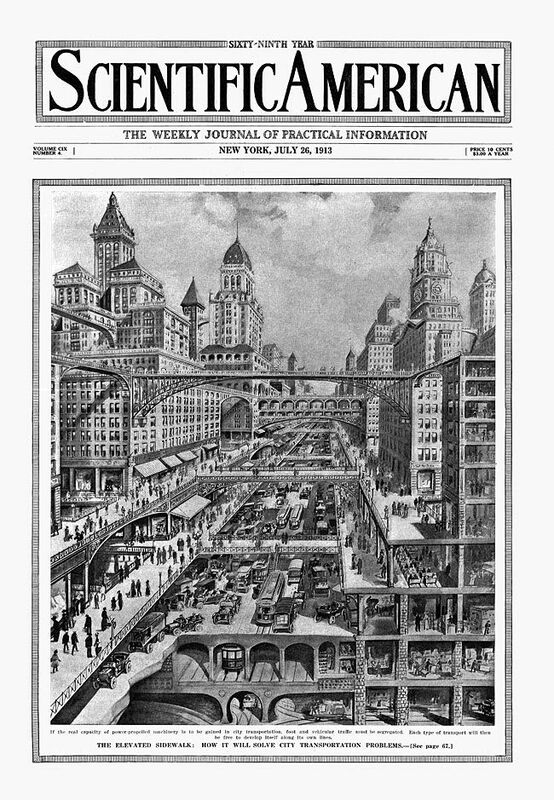 The neighborhood reminds me of this illustration from a 1913 issue of Scientific American; a living, breathing vision of the future dreamt up in the past.